The bacterial cell surface is an important structure as it mediates interactions with the external environment. 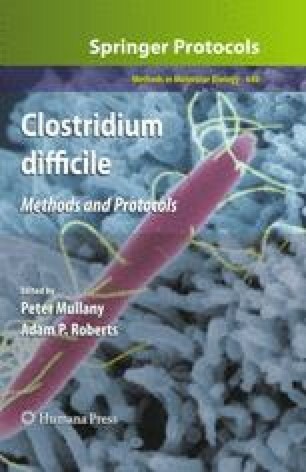 In the case of pathogens like Clostridium difficile, the cell wall and its components also have to mediate interactions with the host cells and their products. In this chapter we discuss the various methods used for dissecting the cell surface and the biochemical and immunological procedures that are commonly used to analyse the properties of the proteins within the cell wall. A major consideration is the S-layer which in C. difficile shows considerable variation in sequence and between strains, a property which is also reflected in its antigenic properties. We thank Anne Wright, Omar Qazi and Natalie Welsh for developing and optimising some of the procedures described in this chapter.